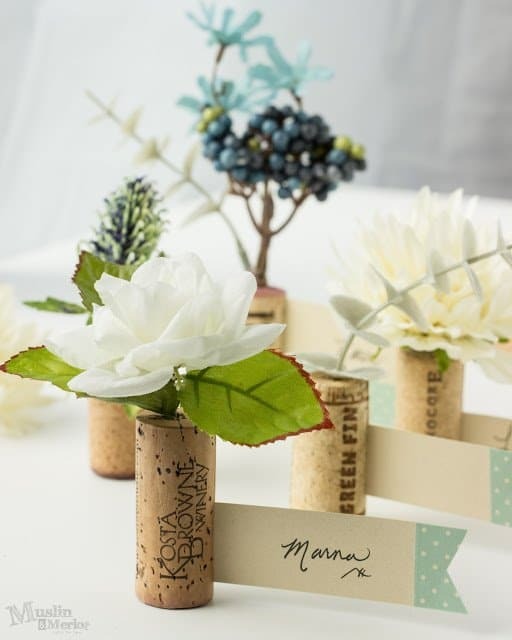 Wine cork craft is one of the most popular DIY craft ideas because it is the easiest and fun project to do. Wine cork craft is versatile and there are a lot of projects out there, which can inspire you to create a lot of these on your own. If you have kids around, then involve them in making these interesting wine cork craft projects and they are sure to love and enjoy making them. 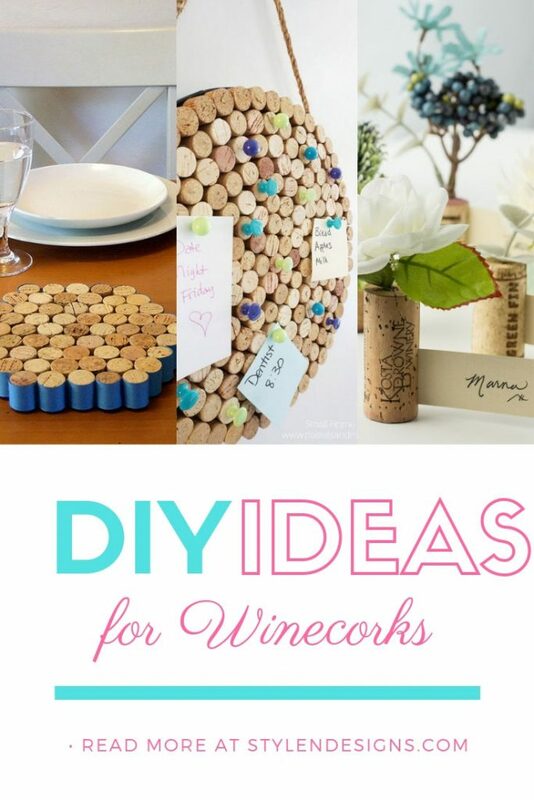 If you have a lot of wine corks with you, then you have endless craft project ideas at your fingertips. If you are a teetotaler, then look around at the local restaurants and bars to collect some wine corks. 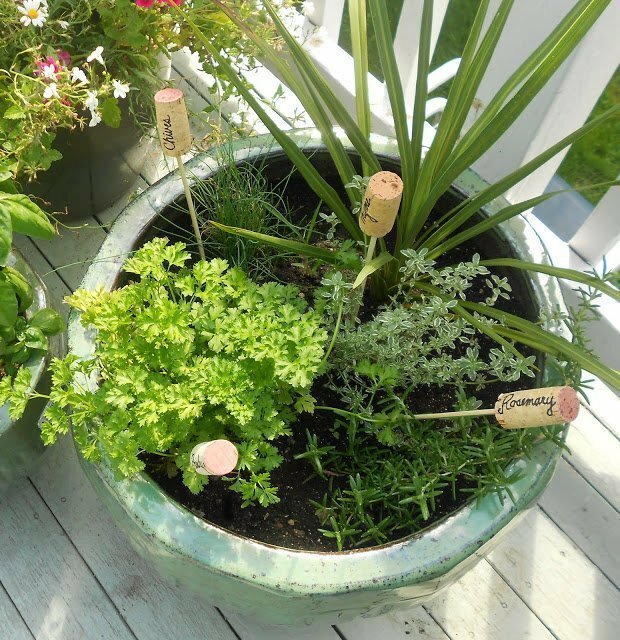 If you have a lot of plants in your garden, then a used wine cork can be used to make garden markers to keep track of all the herbs in the garden. If you have a mix of two to three herbs in a pot, these garden markers can be used to mark each herb for easy identification. This bath mat is a relatively easy project to make on your own and the final product can easily fit into any bathroom style, be it a rustic one or a modern style. This craft idea is wonderful because it offers you a warm and soft surface to step onto when you get out of the shower. Collect sufficient corks to make this bath mat. Make sure they are clean and free of dust and wax. Warm it with soap water and make sure it is completely dry before you begin the craft project. You can make this bath mat with just a few supplies like wine corks, hot glue sticks and a non-adhesive shelf liner. Cut each cork into lengthwise and sand the bottom flat. Arrange the corks into a rectangular shape with the flat side down. Cut the shelf liner to size with a cutter, ruler and a cutting mat. Stick the cork to the shelf liner with glue closely; making sure any extra glue is removed before it dries. 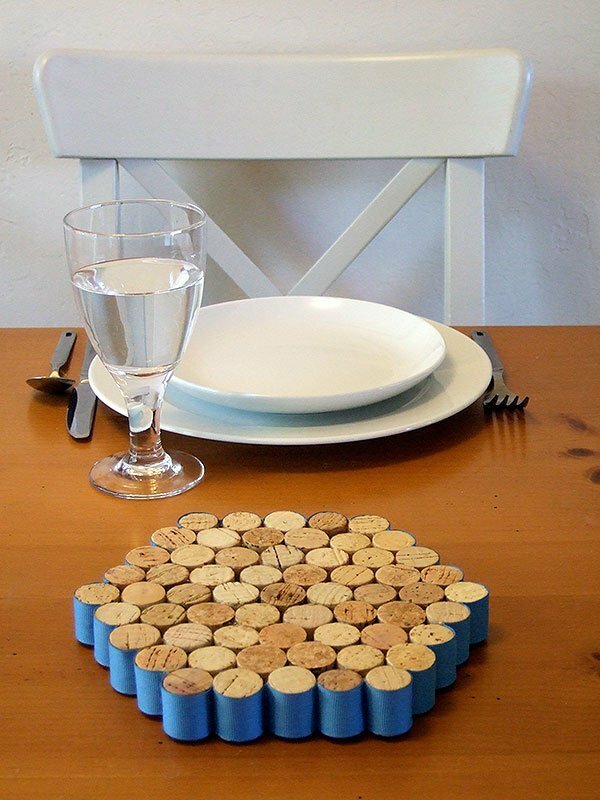 What a better way to make use of the extra wine cork than the cork coaster. This DIY wine cork craft requires very few corks. To make this you will need around 31 wine corks of all same height. Cut each one into half and remove the rough edges using a sand paper. Arrange these corks in a desired pattern and glue the sides together. At the end, glue a ribbon on the outer side to make it look presentable. The final product will be completely different from what it was originally. 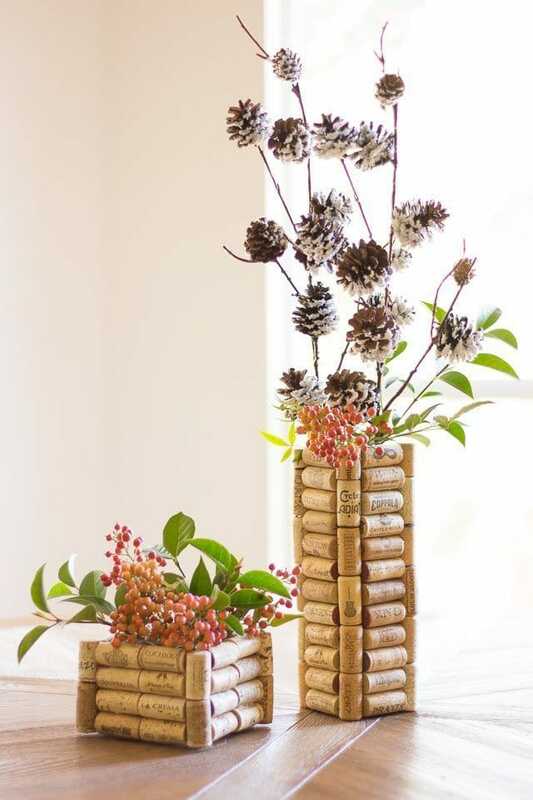 These pretty vases can be made during the holiday season and is a perfect craft for gifting. These vases can be made from any rectangular or cube shaped glass vessel. The following vase was made from tall bud vase with 70 wine corks. A smaller version can be made from a square florist vase and about 40 corks. They are pretty easy to make and can be a nice gift for friends and family. To make this vase, you need very few supplies like a glass florist vases, wine corks depending on the type and size of the vase, heavy duty craft glue and knife. To make the vases look best, you have to look out for corks of similar length. Lay them on one side of your vase and depending on the size of the width of your vase you may have to trim the cork. Glue the corks on one side of the vase and once they are stuck allow it to dry completely. Finish the vase by gluing the corks vertically down the sides. Accordingly adjust the size of the corks depending on the area where it is going. You may even have to cut some corks to fit in places. Cork candle holder is an ideal DIY craft idea. Use a glass cylinder and place it in-between the large glass cylinder. Put wine corks around the smaller cylinder and place a candle in the smaller cylinder. You can go for a scented candle if you like to spread some fragrance in the room. There is absolutely no cost in making this candle holder, except for the candle. 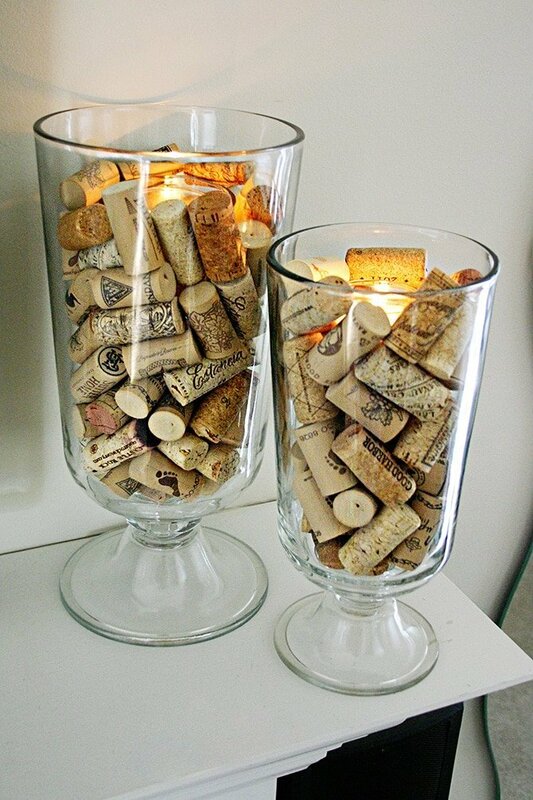 If you don’t have corks at home, then you may have to collect them from a bar to make this candle holder at home. If you are a fan of wine and enjoy it almost regularly, then you will also be having some wine corks if you have collected them as a hobby. If not, then you will have to look in bars and restaurants for wine corks. 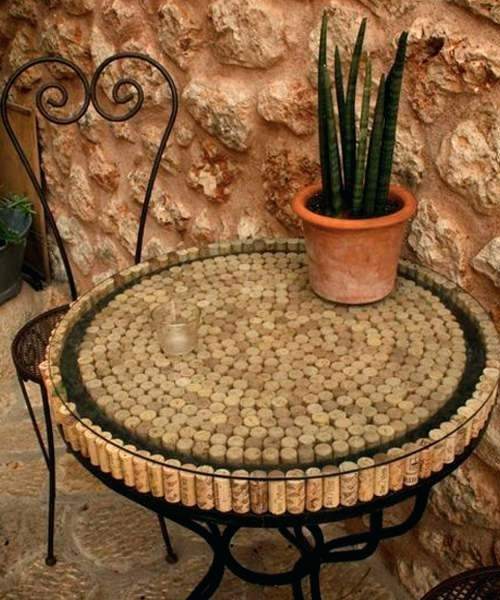 With a wine cork you can make a large project like a coffee table at home. It is a unique coffee table that looks cool and you don’t need coasters too. There is no fear of smudges and these corks can handle just about anything. You can use hot glue, some corks to the top of an old coffee table or tray and your cork coffee table is ready for use. 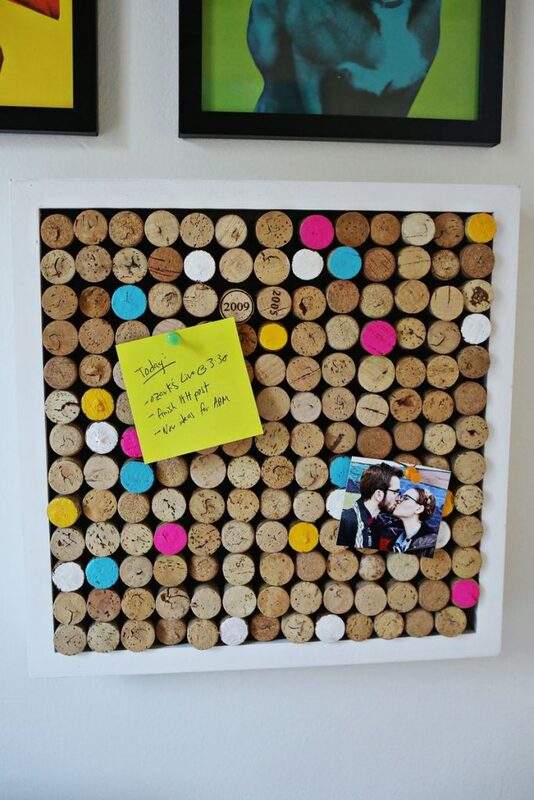 Put to good use wine corks that are lying around the house by making a cork memo board. They are practical, functional and can look pretty cool. Firstly, prepare a frame by removing any glass or any other stuff until it is just a backing board. Decide on the pattern you want to arrange the corks in. A simple pattern will look good. Apply glue around the perimeter of the board on the back side to secure it tightly. Start gluing the corks down and pay attention to the size and shapes of the corks and pick the ones that suit. It need not be perfect. You can even consider cutting the corks into half if you don’t have sufficient corks with you. If you can’t fit a whole cork, then you may have to cut the corks to fit in nicely along the edge. Any extra hot glue spillage needs to be wiped off immediately to have a clean look. You may even consider a single coat of clear gloss to bring out the color and texture of the corks. Allow it to dry and your cork board is ready for use. Wine stuff can be incorporated at parties and one such wine related stuff is the Wine corks. To make place card holders with wine corks, use old wine corks as a base to hold the name cards so that your guests know where to sit. The event need not be a wedding; it can be also used for other casual events. Keep the logos on the cork facing towards the guest, but that is not a rule. You can decide to keep in any other way if you wish to. Now, sand the bottoms flat and make a small cut with a utility knife and then place a plastic card and slide it down the cuts. This will ensure the gap is clear of any chunks making it easier to slide a paper card into the cut. Make sure you are not using a heavy paper or else it might fall. Once they are done, slide some cards or pictures in and they are good to go. 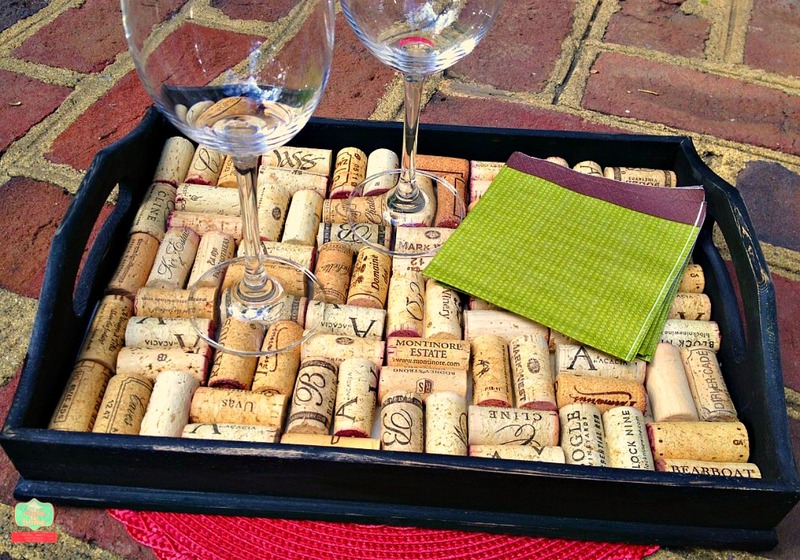 The DIY Wine cork tray makes for a great and inexpensive gift. It can be made within an hour depending on the finish you decide for your tray. Use an unfinished wood tray and make sure the tray you use is deep enough for the cork. You can even consider cutting the cork into half if you have fewer corks or leave it as it is. Firstly, paint the tray with a desired color and finish. Then, using wood glue, carefully place the corks onto the base of the tray and your wine cork tray is ready. If you are looking to gift someone this season, then try the bottle stoppers. It goes perfect with a bottle of wine and the occasion becomes all the more special if you can make it on your own. It is easy and inexpensive too. There are many different ways to make a wine bottle stopper from cork using different materials. Once you master the technique, then there is no dearth of ideas. 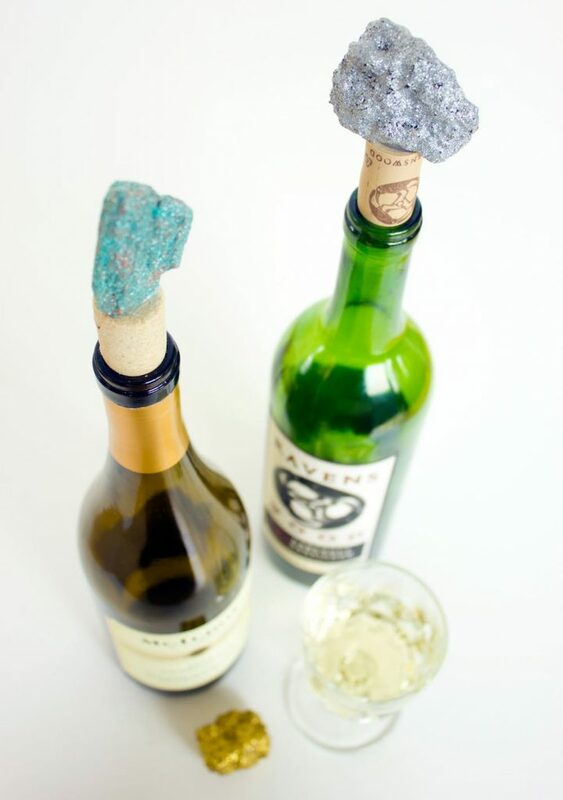 You can paint the corks with fancy colors to make cute looking jewelry or glue in some fancy rocks on the cork to use it as a fancy bottle stopper.